Students will typically apply for AMP in Philosophy in Spring Semester of their junior year. If they are accepted, they will be notified in that same semester and in time for them to enroll in appropriate classes at the start of their senior year so as to enable them to complete AMP in one additional year beyond their senior year. 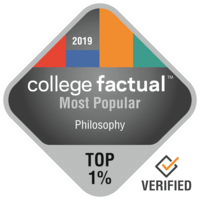 AMP in Philosophy is open only to University of Arizona undergraduates majoring either in Philosophy or Philosophy, Politics, Economics and Law. AMP in Philosophy is independent of the University of Arizona Philosophy Ph.D. program. Students completing AMP in Philosophy will be given no special consideration relative to other applicants if they choose to apply to the doctoral program. 1) Meet the Admissions Requirements established by the Graduate College. Recommended: Having completed at least four Philosophy classes in two different areas. The AMP application code is UAAMP721X01. Incomplete applications will not be reviewed. For general information regarding graduate degrees and tuition, please see Graduate College’s degree and tuition policies . Philosophy of Language, Philosophy of Science, Philosophy of Mind or Cognitive Science. Four of the ten courses that satisfy the requirement of the M.A. may also simultaneously satisfy requirements of the B.A. in either Philosophy or Philosophy, Politics, Economics and Law. AMP in Philosophy will not have a thesis requirement. A student may, however, opt to write a thesis instead of taking one of the graduate seminars. For a petition to be successful, the student must secure a faculty member to supervise the thesis and two other faculty members to serve on the thesis committee and conduct an oral defense. In such cases, the thesis will be a paper of approximately 6,000-10,000 words.